Resort type: DeluxeTheming: The resort is themed after modern architecture as perceived in the 1970’s. Each room was built as a unit and added by crane to the existing frame of the resort. Location: Magic Kingdom resort area located on the monorail. Transportation: Monorail transportation to the Magic Kingdom and Epcot. Bus transportation is available to the other parks. Rooms: Each standard room is 394 square feet and sleeps 5 adults. The rooms either have 2 Queen Beds and 1 Day Bed or 1 King Bed and 1 Day Bed. The resort also offers 1 and 2 bedroom suites and club level rooms. Dining: 1: The Contempo Café. Table Service Dining: 3 including: The ever popular signature dining at the California Grill, or the hard to get character dining reservation at Chef Mickeys. It also features seasonal menu dining at The Wave. Lounge: Several including the California Grill and Wave lounges. Room Service: yes Pools: 2 including the Feature pool with a 17 foot high curving water slide and the Bay Lake pool where loud noises and splashing are discouraged. Kiddie Pool: no Splash & Play area: yes near the Feature pool. Playground: no Arcade: no Dog Friendly: no Pros: The resorts biggest advantage is that it is close to the Magic Kingdom and on the monorail line. So close in fact, that you can walk to the park and enter through a separate entrance with dedicated security. When this resort was built, it was thought to be futuristic in design as all the rooms were made individually and lifted by crane and secured into the resort frame. The monorail travels directly through the building. The decor is streamlined and deluxe with special artwork in the main concourse. 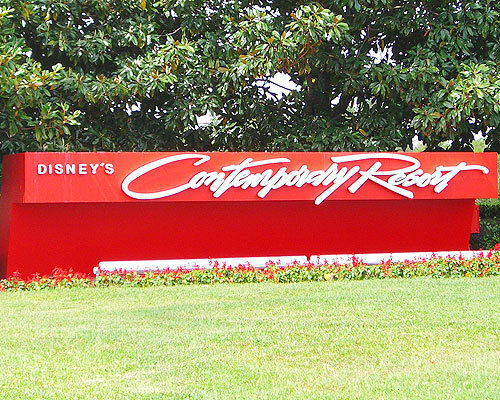 This classic Disney resort was 1 of 3 original resorts that opened in 1971. It also has many wonderful dining experiences including the California Grill restaurant with its fantastic views of Magic Kingdom and amazing cuisine. The resort also has several shops with a good assortment of goods and souvenirs to please the pickiest of shoppers. Located on the Seven Seas Lagoon it offers a great location to watch the Electric Water Pageant or many other water sports such as fishing. The marina on site allows private boat rentals, pirates n pals and firework cruises to name a few. Cons: Due to the way the resort was constructed with the high ceilings and the monorail running through it, you most definitely will experience noise in the main areas, and possibly some rooms located right off the monorail. It requires 3 stops on the monorail to get to Magic Kingdom. While they have 2 pools, they do not have any special or fun themes like the other resorts. Cost is the major reason this resort prices out of many families budgets. The rooms are expensive with a standard room in the Tower costing as much as $855 per night during the holiday season.